Everything tastes better with bacon. One of those flavor-packed, umami-rich, secret-weapon ingredients, it has the power to elevate just about any dish, from soups to souffles, braises to bread pudding. Peter Kaminsky and Marie Rama know just how to employ it. Peter is the author of both Pig Perfect—a paean to the noble swine—and, most recently, Culinary Intelligence, which argues that the healthiest way to eat is to eat less but really well. 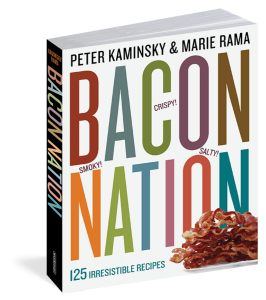 He and Marie know that adding irresistible bacon transforms an ordinary dish into an extraordinary one.